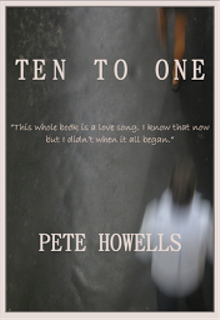 Pete Howells joined the ranks of ‘Best Seller’ with his previous novel ‘Perspective’. ‘Disentangled’ has received similar accolades from discerning readers. Ten To One is due to be launched in November 2012. Following the success of his last two novels this book deals, once again, with the darker side of the human condition. Seemingly innocuous at the outset, we soon begin to unravel the strange world of ‘REAKTA’ whose insistent poetic inserts lead us eventually to the uncomfortable conclusion of this short novel. Besotted by the decimal system and at the sad end of a marriage Lorna makes her own dull world into something she can manage. Or does she? “When there are nine, potentially ten deaths you begin to wander through the random streets of Madness City and then, at some point you begin to wonder if the persona, the character you have created for yourself is any more real than the one you created for your now dead sister, your parents, the babies or, and this is where it all began to make some sense, the strangers you pass each day on the way to work (well not strangers exactly – more like family actually) all with a life that you have created. All with a story that you have made up in order to make sense of them. Ordering them. One of whom is dead already. Pete Howells has taught part-time in a West Yorkshire prison, and worked with teenagers with emotional, behavioural and social difficulties. He has taught Art & English to GCSE and A level. He has also been a singer-songwriter, supporting acts as diverse as Brand New Heavies, Osibisa, Desmond Dekker and Courtney Pine. He lives in Brighton and is at work on his fourth novel. Pete is available for interview by arrangement. Review copies of the book are available upon request. To include music and short readings plus Questions & Answers by the Author. For Free Press Entry please contact Pete Howells at eMail above.